This recipe has been featured on Serious Eats. 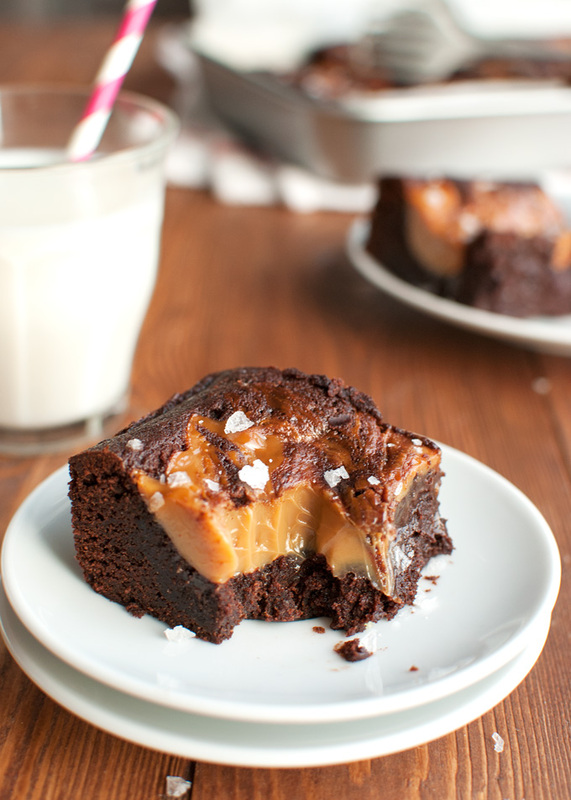 After the chaos of last week I’ve FINALLY found time to tell you about those amazing salted dulce de leche brownies. I’m sure all of you would loooove to know what kept me from sharing it with you for so long and, frankly, I wish I had some amazing excuse or story to tell you. Like: I flew ar0und the world in a hot air balloon. Or: I was kidnapped by monkeys who wanted to teach me swear words in Spanish. But no… Last week was just full of difficult work related assignments and, I’m afraid to admit, hours and hours spent in Thesis Land. Again. Pff, will I ever finish the damn thing? I doubt it. Although I did manage to write 11.782 words in the last week. Which is definitely a step forward! 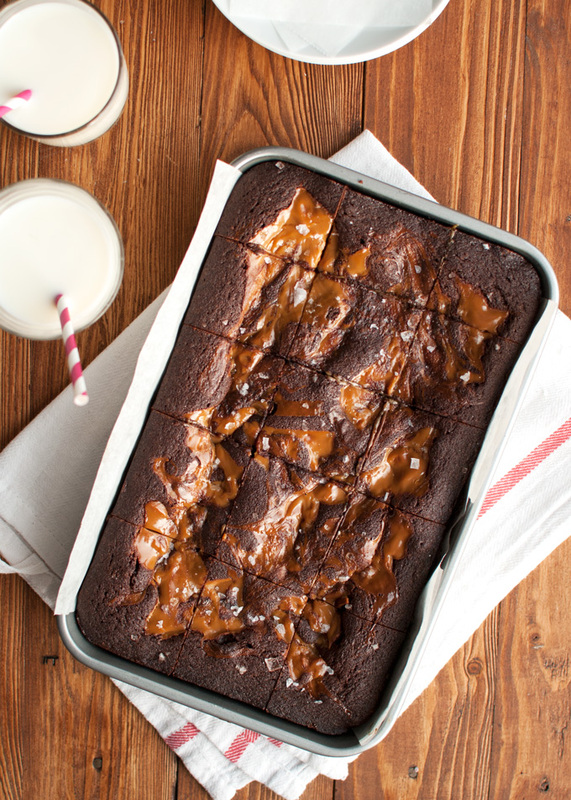 As you can see, these rich, super fudgy brownies – yum – are topped with generous dollops of homemade dulce de leche – YUM – and a generous sprinkle of sea salt – YUM! 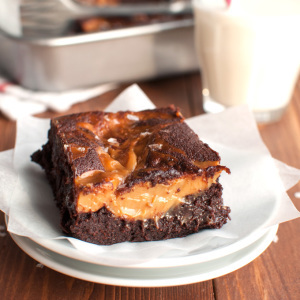 The thick layer of dulce de leche has the same delicious texture as the super fudgy brownie underneath, and the salt complements both the intense chocolate flavor and the delicious sweetness of the dulce de leche. And yes, they may remind you of these brownies I made last year! 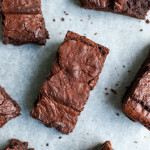 The two brownie recipes look similar, but they’re actually pretty different. So if you’re a fudgy-brownie-lover just ignore your brownie-making instincts for a while. 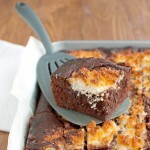 And seriously, does this brownie look cakey to you? I. Don’t. Think so. After you’ve creamed butter and sugar together, simply add eggs, flour, cocoa powder and some other things, like salt and vanilla. Mix, mix, mix, plop on some dulce de leche and bake! But wait, how are these brownies different from last year’s brownies? Well…. Last year’s brownies were made with a combination of granulated sugar and golden syrup. But as it turns out, golden syrup is not widely available all over the world. Which is a damn shame if you ask me, because it’s awesome. Today’s brownies are instead made with a combination of granulated sugar, light brown sugar and corn syrup (or glucose). The brown sugar not only adds moisture but also intensifies the chocolate flavor by giving it a hint of butterscotch (thus making up for the lack of golden syrup in these babies), while the glucose – a liquid sweetener – makes these brownies super fudgy! Now for the dulce de leche. If you’re a regular reader, you’ll know all about my love affair with dulce de leche. I always use homemade dulce de leche, because it’s super easy to make and the flavor is awesome! I always use the closed can method, but you can use any kind of method you like. 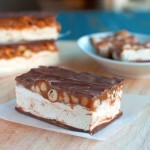 For inspiration, check out my series on ‘Making Dulce de Leche‘. Anyway, to make dulce de leche in the can, just take a can of sweetened, condensed milk, remove the label and place the can in a large pan. Fill the pan with water, making sure the water level rises about two inches above the top of the can, place over high heat and simmer for two to three hours. For this recipe, I advise you to cook the can no longer than two hours, otherwise the dulce de leche may get too dark in the oven. Once cooked, remove the can from the water with a pair of tongs (spelled it right this time!) and allow it to cool to room temperature before opening it. That’s it! Oh, and you might want to make two cans. 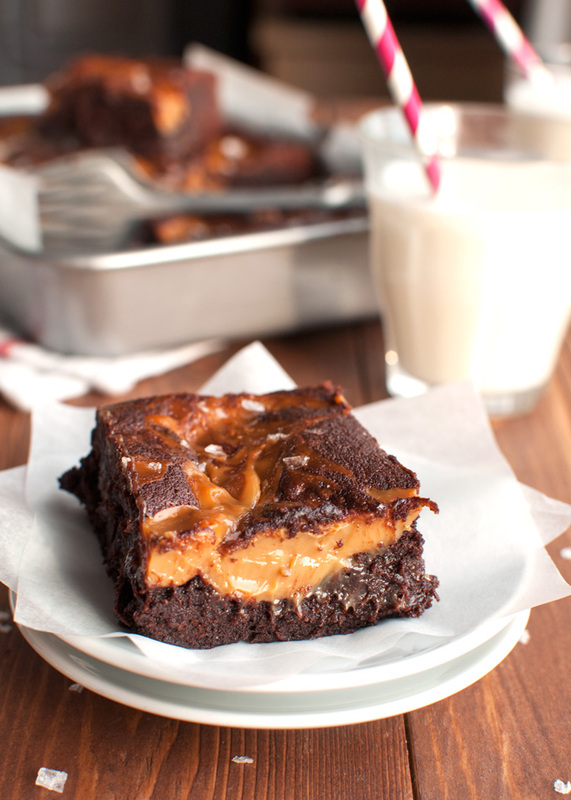 Dulce de leche is pretty hard to resist… Especially paired with fudgy brownies and sea salt! 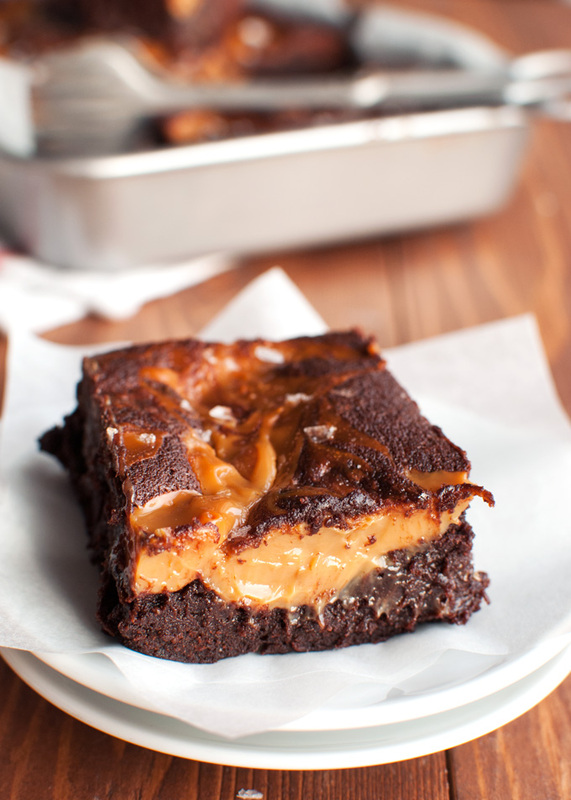 So there you have it: super fudgy brownies with an intense chocolate flavor topped with generous dollops of thick, creamy dulce de leche and a sprinkle of sea salt… I’m gonna make another batch! After all, I’ll need some serious fuel if I’m gonna try to write another 11.782 words for my thesis this week. Adjust oven rack to middle position and preheat oven to 175°C/350°F (standard oven setting). Butter a 29x19-cm/11x7-inch brownie pan and line the bottom and long sides of the pan with baking parchment. In a large bowl, mix butter until creamy and lightened in color, about 1 minute. Add sugars, glucose and vanilla and mix until incorporated. At the eggs one at a time, mixing after each addition until incorporated. 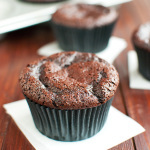 In a small bowl, stir together flour, cocoa powder and table salt and add to the butter mixture. Using a rubber spatula, fold the dry ingredients into the wet ingredients. Once the batter looks somewhat incorporated, mix for about 30 seconds until the batter is smooth. Pour the batter into the prepared brownie pan. Dollop spoonfuls of dulce de leche onto the batter and use a knife to swirl the two together. Bake for 15 minutes, then sprinkle over the sea salt. Bake for another 15 minutes, remove from the oven and allow to cool to room temperature. 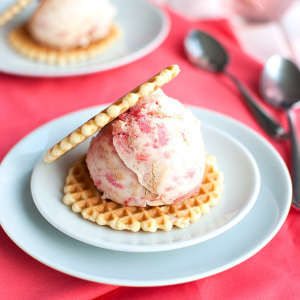 Cut and serve as desired, with ice cream, cold from the fridge or with another sprinkling of salt. I was wondering if its ok to leave out the corn syrup? Or if not, are there any substitions? And if so, how much of it should be used for this recipe? 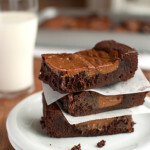 Hi Soli, the corn syrup gives these brownies their super fudgy interior, so I wouldn’t leave it out. You can, however, use golden syrup instead! 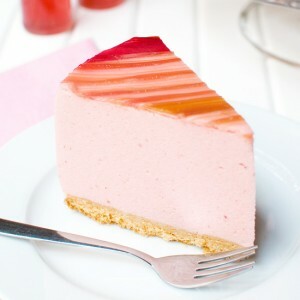 Just check out this recipe! It’s similar, but I use golden syrup instead of corn syrup. 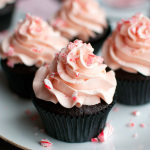 I just made theese and they are fantastic! 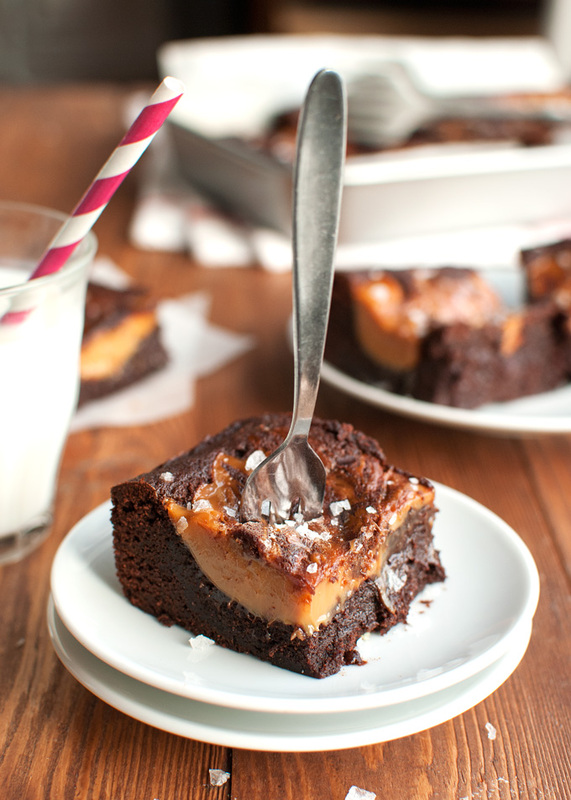 A rich fuydgy brownie and creamy pools of dulche de leche swirled throughout.